The recent holiday caused me to missed out on the statistic for August 2009 (which were published online but has since being updated). Nevertheless, here are the update until 30 September 2009. Guys, check out Soekarno-Hatta is all set to take over Changi for the first time! KUL dropped 1 place to no. 28. KUL's rank for international passengers handled also drop by a place, currently we are at no. 20 in the world. KUALA LUMPUR, Feb 10 — Total passenger movements at the airports operated by Malaysia Airports Holdings Bhd (MAHB) increased by 8.2 per cent to 51.335 million in 2009 compared with 47.448 million in 2008. MAHB, in a filing to Bursa Malaysia today said the KL International Airport (KLIA)’s passenger movements amounted to 29.682 million last year. This was higher by 7.8 per cent from the 27.53 million recorded in 2008. Meanwhile, other airports’ passenger movements in 2009 rose to 21.653 million from 19.918 million previously. MAHB, however said total cargo movements last year declined by 13.8 per cent to 803.964 million kg from 932.439 million kg in 2008. The airport operator said aircraft traffic at the KLIA rose by 7.4 per cent to 225,251 planes in 2009 from 209,681 planes in 2008. 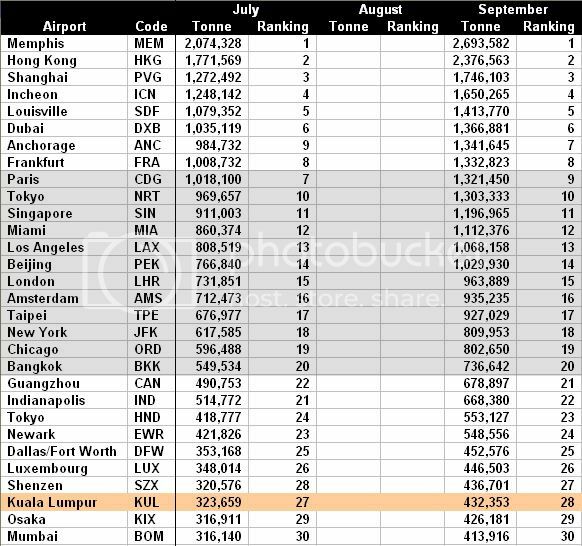 OMG, KLIA is almost reaching the 30 million mark! Very good news indeed. They must be thanking to AirAsia for the number. Can't wait to peruse the details in MAHB's Annual Report for 2009. 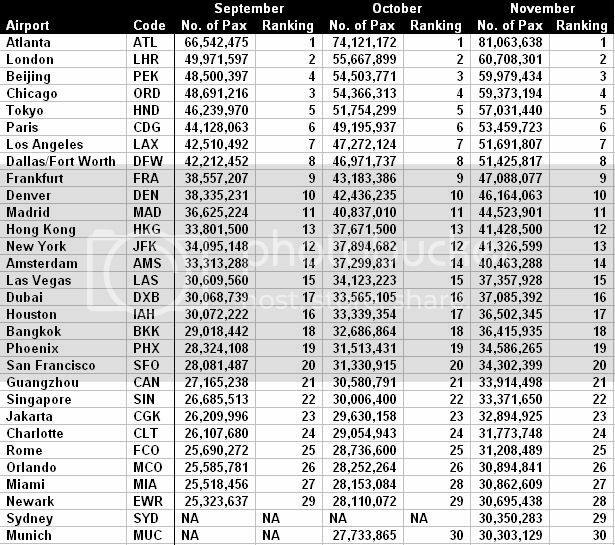 SIN total pax up to Sep 09 is 26,685k while its total international pax is 25,845k. That's mean there are 840,000 "non-international" (or domestic) pax in SIN ? Similarly to HKG as well. Great start for KUL for 2010. JUMLAH pergerakan penumpang di lapangan terbang yang dikendalikan Malaysia Airports Holdings Berhad (MAHB) meningkat 15 peratus kepada 4.36 juta pada Januari tahun ini berbanding 3.79 juta dalam tempoh sama tahun lalu. Dalam satu kenyataan di Kuala Lumpur, kelmarin, MAHB berkata pergerakan penumpang di Lapangan Terbang Antarabangsa Kuala Lumpur (KLIA) Sepang meningkat 19.7 peratus kepada 2.6 juta berbanding 2.17 juta tahun lalu. KUALA LUMPUR, March 9 — Total passenger movements at the airports operated by Malaysia Airports Holdings Bhd (MAHB) increased by 15 per cent to 4.36 million in January 2010 compared with 3.79 million in the same month of 2009. In a statement here today, MAHB said the KL International Airport’s (KLIA) passenger movements rose by 19.7 per cent to 2.60 million from 2.17 million a year ago. “International passengers at the country’s main airport went up by 26.4 per cent to 1.82 million while domestic passengers rose by 6.6 per cent to 781,474,” it said. As for other airports, MAHB said international passenger movements added 25 per cent to 317,051 while the domestic passenger movements rose by 5.5 per cent to 1.44 million. MAHB said overall, the other airports posted 8.6 per cent growth with 1.75 million passengers recorded in January this year. It said total cargo volume saw an increase of 21.1 per cent to 68.99 million kg from 56.91 million kg in the same month of 2009. Cargo movements at KLIA went up 28.3 per cent to 50.30 million kg, it said. “International cargo movements climbed 30.5 per cent to 45.75 million kg, while domestic cargo went up 10.1 per cent to 4.54 million kg,” it said. As for the other airports, the cargo movements went up by 5.6 per cent to 18.692 million kg with international cargo movements up 5.8 per cent to 11.13 million kg and domestic cargo widened 5.1 per cent to 7.55 million kg, it said. It said the number of aircraft movements also increased with KLIA recording a 7.3 per cent growth to 19,968 movements in January, while movements at other airports rose 10.8 per cent to 27,583. “At KLIA, the international aircraft movements perked up 6.2 per cent to 12,527 while the domestic movements climbed 9.1 per cent to 7,441. Yes, I also saw the differences of numbers for airports that supposedly don't handle any domestic flights like SIN, HKG and DXB. But probably the differences are made of cargo flights, charters, military or special movements? These data are from Airport Council International. Soekarno-Hatta is still short to pass Changi for the first time. The bottom 5 places look very stiff, Kingsford Smith re-enters the top 30 places. Also interesting to watch is the Hong Kong - Kennedy match and also will Dubai gets to pass Vegas? KUL fall 2 places in the rank, down from no. 27 to no. 29. As mentioned in the news article above, KUL handled 803,964 tonne of cargo by 31 December 2009, a decline of 13.8% when compared to 2008. I wonder whether the amount will tally in the end. KUL's placing improved to no. 19 from no. 20 in the previous month. Singapore's Changi Airport, Asia's fifth largest, saw an 18.8 percent rise in air freight movements by tonnage in March from a year ago, indicating strong demand for goods, data showed on Thursday. The airport also recorded an 18.8 percent rise in the passenger movement in the same month, its third consecutive double digit growth in passenger traffic. Changi Airport Group said it handled 3.45 million passengers last month, and 157,211 tonnes of airfreight. The improvement comes after airline industry body IATA said on Wednesday that demand for both international air travel and air freight accelerated in March with the rebound on the back of economic recovery exceeding expectations. However the recovery might be dented a bit by the closure of large parts of European airspace in April due to the volcanic ash from the eruption in Iceland, which caused thousands of flights to be cancelled, affecting millions of people. Singapore Airlines said this month it filled 72.9 percent of the passenger and cargo space available on its planes in March, up from 62.6 percent a year ago and 71.4 percent in February. Great start for KUL in 2010! PUTRAJAYA, May 26 (Bernama) -- The country's economy which expanded by 10.1 per cent in the first quarter this year also gave boost to air passenger and cargo traffic during the period. Transport Minister, Datuk Seri Ong Tee Keat said passenger traffic went up 21.2 per cent to 13.8 million passengers compared with 11.3 million passengers in the same period of last year. "This was a jump," he told reporters before chairing a post cabinet meeting at his ministry here Wednesday. He said the KL International Airport (KLIA) handled the largest number of passengers, accounting for 7.9 million passengers or 57.7 per cent of the total number of people who travelled by air. It was a rise by 24.5 per cent. The Low Cost Carrier Terminal (LCCT) meanwhile handled 3.5 million passengers compared with 2.8 million passengers in the corresponding period of last year, a rise by 25 per cent. As for cargo performance, Ong said the traffic went up 19.7 per cent in the first quarter of this year with 211,092 metric tonnes handled compared with 176,355 metric tonnes handled previously. KLIA handled the majority of the cargo, taking up 154,098 metric tonnes or 73 per cent of the total cargo. It was an increase of 25.7 per cent from the previous figure. LCCT saw an increase of 184.4 per cent in cargo handled or by 11,919 metric tonnes compared with the previous corresponding period. KUL handled 29,682,093 passengers movement in 2009, up 7.8% from 27,529,355 in 2008. We can expect KUL to break into the 30 million+ passengers category this year. Suvarnabhumi and Changi are not that far from reach, but caution about Soekarno-Hatta. Nevertheless bravo! Two (2) airports recorded an extraordinary growth, IPH (308.1%) and SZB (166.4%) but these numbers are expected due to the emergence of these 2 airports as FireFly's key destinations. The airport which recorded the highest growth under normal circumstances is AOR (+ 37.0%) while MKZ is the worst performer (- 21.8%). BKI is Malaysia's busiest airport for domestic transfer passengers while KUL of course, for international transfer passengers. Sorry to refer to earlier post of yours Azizul, but how can Singapore have 33.3 million TOTAL passengers, but only 32.3 million INTERNATIONAL passengers? So 1 million passengers travel from Changi to Seletar? I am surprised to see PEN slipping.. Come on PEN. Sorry to refer to earlier post of yours Azizul, but how can Singapore have 33.3 million TOTAL passengers, but only 32.3 million INTERNATIONAL passengers? So 1 million passengers travel from Changi to Seletar? What am I missing here? I think I answered that before. Or maybe SIN supplied wrong data to ACI. Thanks for your analysis. Yes it is a little surprising to see PEN slip - perhaps the SQ pull out is affecting arrivals. However, I think that for 2010, it should recover since AK has opened up some new routes out of PEN. KBR is no surprise as I see most AK, MH and FY flights are packed. I guess the absence of a convenient road and rail transport system is causing the people to use air services. I guess the absence of a convenient road and rail transport system is causing the people to use air services. Why do you think us people here in Sabah/Sarawak 'like' to fly so much ?! I'm surprised that KUL handles almost 30 million passengers a year! But I suppose a significant portion comes from the LCCT. I'm also shocked that SYD only handles about 30 million passengers a year! In Australia, you don't have to go through SYD to get to other places. PER, MEL, ADL, and BNE offer flights to DXB, KUL, SIN and others without having to transit at SYD. But from Malaysia, you need to go through KUL to go to those places. Talk about KUL-centric. That is so true, perhaps, because Australia is such a huge country would not be economical for people from PER to transit at SYD for flight to Europe. In Malaysia, not many people can afford to fly internationally or have no reason to do so, so bringing the whole traffic into one place, i.e. KUL will be more economical than operating flights out of a few different places. Edited by Johan Z, 19 June 2010 - 10:10 AM. MH's market share further spiraling down from 38.4% in 2008 to 33.1% in 2009. Kindly be informed that MH held 45.4% of international sector market share in KUL in 2007. MH carried 450,905 less passengers in 2009 than it did in 2008. On the other hand, AK's market share improved from 21.1% in 2008 to 25.5% in 2009. AK carried 1,192,382 more international passengers in 2009 than it did in 2008. The difference of passengers number between MH and AK is 1,490,774 in 2009, compared to 3,134,061 passengers in 2008. 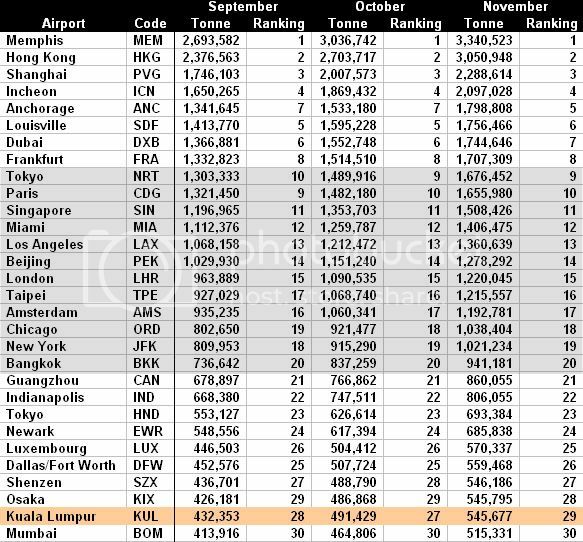 AK is fast becoming the largest international airline in KUL. The figures for AK above are for 'AK' coded flights only, which means it excluded its sister airlines - D7, QZ and FD. As a group, the AirAsia group has already clinched the title of the largest airline group operating in KUL. Also interesting to note as well, out of the top 10 international airlines in KUL, 3 of them belong to the AirAsia group, while another 2 belong to the SIA group. All 3 global alliances are well represented by the top 10 international airlines in KUL - OneWorld with CX, Star with SQ, TG and MI while SkyTeam with KL. Airlines with global alliances association comprised of 50% of the top 10 international airlines in KUL. 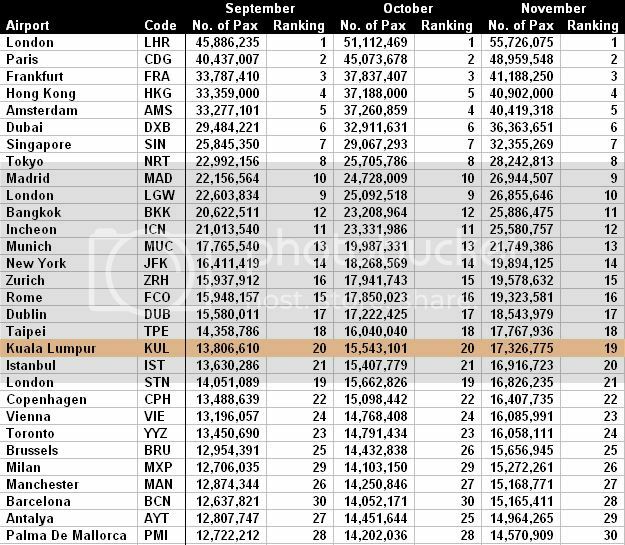 Out of the 10 largest airlines in KUL, 3 are LCC, while the other 7 are legacy. The massive dip of SQ's market share and MI's sudden rise is inter-related as SQ handed over quite a bulk of their flights to MI when the KUL-SIN vv route was liberalised since October 2008. 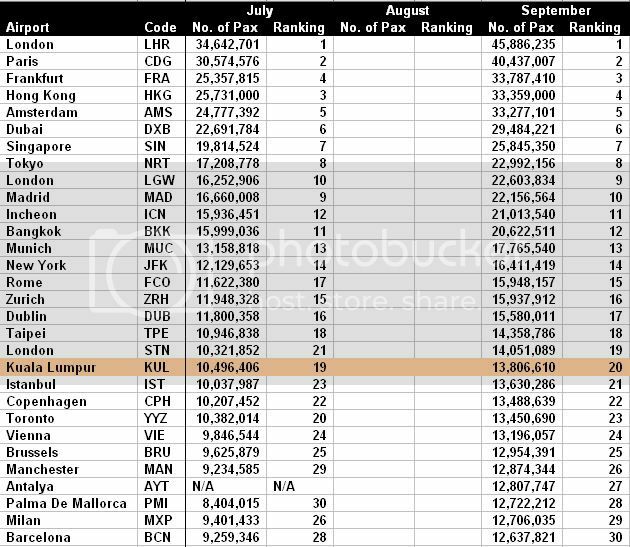 The largest foreign airline in KUL for international sector is QZ, surprise, surprise!